Buy with confidence! Our Reconditioned items include all necessary parts and are guaranteed to function like new, backed by our 120 Day Money Back Guarantee. Please note however that reconditioned units received from the manufacturer may or may not include accessories shown with this listing.Optimized for the professional who frequently encounters precision fastening applications, the Milwaukee M12 12V Cordless Lithium-Ion Sub-Compact Screwdriver Kit delivers unmatched precision, power and portability along with a slimmer, more ergonomic grip. A variable speed trigger and 0 - 500 RPM give the user unrivaled fastening control, 15 + 1 clutch settings prevent over tightening fasteners, and 175 in-lbs. of torque provides the ability to accomplish tough applications. At 6-1/2 in. long and weighing only 2.0 lbs. its compact, lightweight and durable design provides greater comfort and fits in tighter spaces on the jobsite. The onboard LED light and fuel gauge help you increase productivity and avoid interruptions. Two belt-clip positions for both left and right handed users and one-handed bit changes provide maximum ease-of-use. The REDLITHIUM Battery Pack delivers more work per charge and more work over pack life than the competitors. 25% more powerful than the competition with 150 in-lbs. of torque, while operating at 0 - 500 RPM. Max. Fastening Capacity (Screw Diameter): 1/4 in. Max. Wood Drilling Capacity (Twist Bit): 1/2 in. Looked brand new, if it weren't for the on purpose marking, marking it as a refurbished tool, you wouldn't know that it wasn't brand new! So far works great for the things I have used it for. 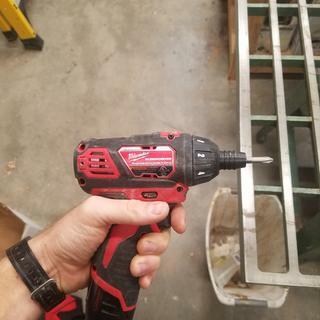 Small and convient, this way I dont have to take out my bigger drill. Haven’t had a chance to wear out the battery yet but I will try on my next project. Great deal and free shipping! Looks and performs like new at a great price! I have purchased 4 of the 2401 Milwaukee drills as well as the orbital sanders. All have stood up well and perform work needed. I did find this last purchase difficult due to a glitch in there purchasing system. Because I buy for my personal use as well as for two boat shops I use several address. There program kept canceling my order due to it thinking I was not an account. It was most annoying. these m12 tools are easier to maneuver than big and clumsy 18v tools. they don't wear me out as much. the driver i got, came with 2 batteries, so i can keep going. little clip on the side to keep it with you. i've got arthritis and don't like to haul heavy stuff around if I can help it. Again another piece added to my collection of great Milwaukee tools. They always come through in the crunch. Small, bursting with torque, tons of power from a tiny battery... I use this constantly on the jobsite, and I still have not needed to recharge it. That blows me away. I've had it for a week now. 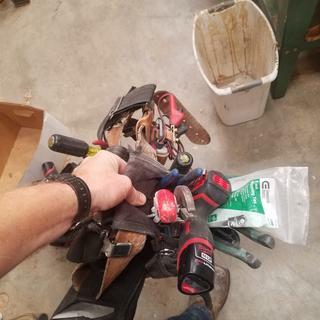 That's like 5 charges for my old DeWalt NiCad set, not to mention the weight of carrying around extra batteries if you're not close to a power outlet. I bought a drill and an impact driver too, because the value for refurbished is hard to ignore. I guarantee you I'll be putting a scratch or two on a new tool the first day of use, so I might as well get the "certified pre-scratched" one for less money. I love it, I love it, I love it. Thanks guys. An excellent quality tool at an excellent price. Does this come with charger? The Milwaukee 2401-82 includes the model 48-59-2401 charger. If we order today when will we get the drill? BEST ANSWER: The milr2401-82 is in stock in our warehouse in Georgia.Depends on where you are located in the US to determine delivery schedule.e.g. east coast 2 days,midwest 3 days,west coast 4 to 5 days. The video says that the driver has 174 inch pounds of torque, but your listing says it is 150 inch pounds of torque, which is correct? And why is it that this driver only comes with one battery, yet the Bosch and Dewalt screwdrivers come with two batteries. BEST ANSWER: Per the manufacturer that unit has 175 in-lbs of torque.Milwaukee has chosen to sell this kit with only one battery,they do offer other kits with 2 batteries. What's the difference between the "new" 2401-22 kit and the refurbished 2401-82 kit? BEST ANSWER: The 2401-22 is new and the 2401-82 is reconditioned, they are the same model. The new unit carries a 5 year limited warranty and the reconditioned unit carries 1 year limited warranty. The Milwaukee Reconditioned Product Limited Warranty Every MILWAUKEE RECONDITIONED product is warranted to be free from defects in material and workmanship. Subject to certain exceptions, MILWAUKEE will repair or replace any part on a reconditioned product which, after examination, is determined by MILWAUKEE to be defective in material or workmanship for a period of one (1) year after the date of purchase. Return the reconditioned product and a copy of proof of purchase to a MILWAUKEE factory Service /Sales Support Branch location or MILWAUKEE Authorized Service Station, freight prepaid and insured. This warranty does not apply to damage that MILWAUKEE determines to be from repairs made or attempted by anyone other than MILWAUKEE authorized personnel, misuse, alterations, abuse, normal wear and tear, lack of maintenance, or accidents. THIS WARRANTY SUPERSEDES ANY PRIOR OR OTHER WARRANTIES CONTAINED IN ANY OPERATOR'S MANUAL OR OTHER DOCUMENTS RELATING TO THIS PRODUCT. THIS IS THE ONLY WARRANTY APPLICABLE TO THIS RECONDITIONED PRODUCT. All reconditioned product is etched or stamped with the MONTH & YEAR in which it was reconditioned, along with an “R” - Recondition Designation and the reconditioning plant location designation. Product etched or stamped with an RG09-08 or later date code will be covered by the above one (1) year limited warranty – if the date code reads RK08-08 or before it is covered by the Milwaukee five (5) year new tool limited warranty. Warranty Registration is not necessary to obtain the applicable warranty on a MILWAUKEE product. The reconditioning date of the product will be used to determine the warranty period if no proof of purchase is provided at the time warranty service is requested. MILWAUKEE does not cover return freight or labor charges associated with the inspection and testing of reconditioned product that is found by MILWAUKEE not to be a valid warranty claim. A valid warranty claim must be substantiated by the discovery of defective material or workmanship by MILWAUKEE. ACCEPTANCE OF THE EXCLUSIVE REPAIR AND REPLACEMENT REMEDIES DESCRIBED HEREIN IS A CONDITION OF THE CONTRACT FOR THE PURCHASE OF EVERY MILWAUKEE RECONDITIONED PRODUCT. IF YOU DO NOT AGREE TO THIS CONDITION, YOU SHOULD NOT PURCHASE THE PRODUCT. IN NO EVENT SHALL MILWAUKEE BE LIABLE FOR ANY INCIDENTAL, SPECIAL, CONSEQUENTIAL OR PUNITIVE DAMAGES, OR FOR ANY COSTS, ATTORNEY FEES, EXPENSES, LOSSES OR DELAYS ALLEGED TO BE AS A CONSEQUENCE OF ANY DAMAGE TO, FAILURE OF, OR DEFECT IN ANY PRODUCT INCLUDING, BUT NOT LIMITED TO, ANY CLAIMS FOR LOSS OF PROFITS. THIS WARRANTY IS EXCLUSIVE AND IN LIEU OF ALL OTHER WARRANTIES OR CONDITIONS, WRITTEN OR ORAL, EXPRESSED OR IMPLIED. WITHOUT LIMITING THE GENERALITY OF THE FOREGOING, MILWAUKEE DISCLAIMS ANY IMPLIED WARRANTY OF MERCHANTABILITY OR FITNESS FOR A PARTICULAR USE OR PURPOSE, AND ALL OTHER WARRANTIES. This warranty applies to RECONDITIONED product sold in the U.S.A., Canada and Mexico only.